Waddles adds some cute Adélie penguins that waddle around. With realistic sounds, they provide a great atmosphere to icy biomes. Feel free to use Waddles in any kind of modpack, as long as you link back to this page and don’t make any money of the modpack. * Thanks to Wiiv for making the Adélie Penguin model and textures! Yes I will. I was going to yesterday, but there is a couple of issues in Forge that needs to be sorted out first, so might be a little while. How do we install this mod for snapshot 18w50a actually? This is one of my favourite mods! Also, when I figured out how to download mods about a year ago, this was one of the first mods I ever downloaded (In fact, it was the first one I saw!) and I still use it all the time! 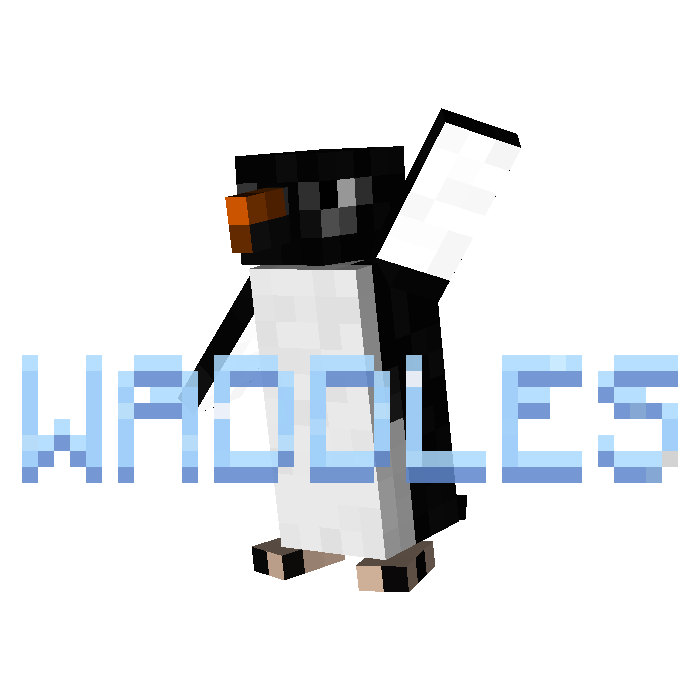 Do the penguins do anything (such as drops like feathers or fish) or are they simply atmospheric mobs? Have you worked on the underwater AI yet? Is there a way to make them available to spawn in the ocean instead of just on land? It said it didn't have the mods it needs to support it, what are those mods? Are these adorable things tame-able/breed-able? If yes how so? Sorry if this has been asked before. They are breedable. They can be breed with fish (cod) or salmon atm. Plans to update this to 1.13? This would be perfect for the new underwater mechanics! As i heard, the Minecraft 1.13 code will be different and then it will be harder to make mods to the 1.13. Excellent! There hadn't been an update in a while, so I was worried that Waddles may have been abandoned. But I understand with such a drastic game update coming up that the desire to add features to the current version probably isn't great, as you'd just have to re-code all of it once 1.13 is released. Looking forward to seeing Waddles swimming around in Update Aquatic! Haven't really been anything I wanted to add to the mod - besides proper swimming AI/animation, but haven't had time to look further in to that recently. I like it, cute penguins. I think you should add more penguin species!